Is Satellite Internet the Solution to Rural Business Connectivity? Farms, research and development, factories… they’re rarely in driving distance of a city. Often, such businesses are completely remote, perhaps cut off by landscape (moorland, mountains, and marshland) or sea. At a time when 4G internet is a realistic replacement for fiber and copper in rural areas, what impact can the improving speed of satellite internet have? Satellite Internet: Who Is Selling It? A cursory glance at the list of current satellite internet providers will reveal very little. Viasat (formerly known as Exede) and HughesNet appear to be the only players in this industry, offering download speeds comparable with cable internet (although the prices are much higher). However, this doesn’t tell the full story. 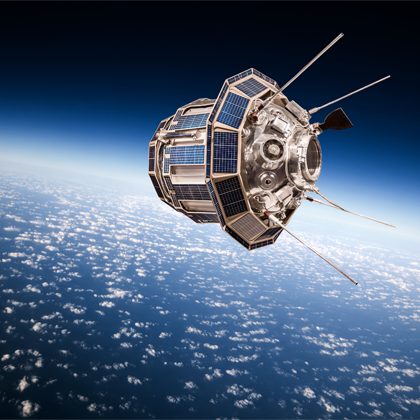 Over the past few years, as the space economy has been targeted by corporations, the idea of satellite internet has gained new momentum. While many satellite ISPs have fallen by the wayside, other, bigger names have thrown their hats into the ring. Along with ViaSat, familiar internet giants Facebook, and Google have announced separate interest in satellite internet. Meanwhile, orbital travel firms SpaceX and Virgin Galactic are also planning internet beamed down from the firmament. As mentioned elsewhere, mobile internet’s migration to 4G is a massive advantage for rural businesses. But it is limited by the existing network; a chain of masts is required, and where these are absent, 4G speeds cannot be reached. Ten times faster than its predecessor, 4G can deliver download speeds between 5 and 12 Mbps (Megabits per second). Satellite internet, meanwhile, can beam data to subscribers at anything from 12 to 100 Mbps. With satellites positioned around the world capable of beaming data to users via a base station, the possibility of delivering high speed internet to rural areas and remote startups alike is nearing. The benefits here are obvious, but of course, the infrastructure is somewhat vulnerable. One of the most obvious problems facing satellite internet is the weather. Thick cloud cover is as likely to block a signal carrying the latest from Facebook as it is the Monday Night Football. It doesn’t matter whether the clouds are carrying rain, snow, hail, rumbling with thunder and lightning. Satellite data is prone to interference from the weather, and unfortunately suffers from high latency. The result is a system that is no good for gaming, and largely incompatible with VPNs. Then there’s the dynamic. Data is sent via a base station to the satellite, then to the subscriber. Not only is the satellite a remote unit susceptible to the risks of being in orbit, the base station and the subscriber need to remain in constant contact with it. This poses a risk for remote subscribers of satellite internet. The distances are so great that there is a risk of long term downtime until other satellites are launched. And then there’s security. With the wrong approach, “raining data” could potentially be hacked by cybercriminals miles from the subscriber’s location. We’ve already seen how existing television satellite signals have been hacked for data purposes, and satellite internet aimed at businesses are likely to be targeted by cybercriminals. Regardless of who ends up providing satellite internet, downloading data from the heavens should provide rural businesses with a realistic and reliable (compared to miles of unserviced copper) means to communicate online with customers, suppliers, and collaborators. With SpaceX having launched the first of two Starlink satellites in 2018, and Facebook planning to launch its Athena satellite in 2019, the question isn’t if this will happen, but when. And with the big bucks behind both companies, remote and rural business will benefit, as will potential customers currently forced offline simply because they live in the “wrong” part of the world.